These pieces come in a variety of styles, sizes, materials and weights. They could also have different options on the bottom such as felt pads. Let’s take a look at a few options. The styling of the pieces has evolved over the years to include a variety of styles. 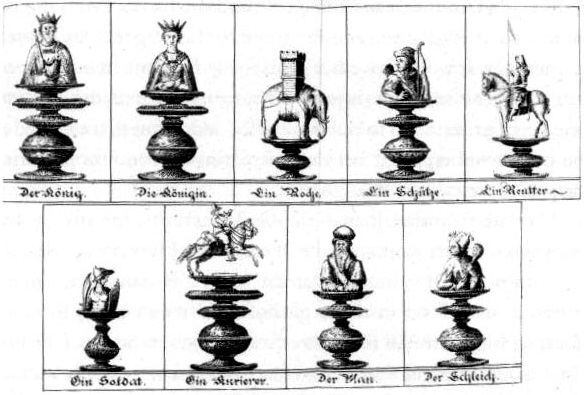 The picture below is of the pieces to a game called Courier Chess which was a predecessor to modern chess. Note that this game used three more pieces than modern chess; the courier, man and jester. There are more styles than I could ever hope to discuss here, fortunately there is only one style today that absolutely has to be covered and that is the Staunton design. First released in 1849, the Staunton chess set is used in all tournaments around the world, and is in the official rules of chess as the design that should be used. While there are many variations on this set (such as the level of detail in the knight), you will find they all pretty much resemble the image shown above. You can get a set of Staunton Tournament Pieces, Triple Weighted with 3.75″ King and 2 extra Queens for around $16. If you prefer wooden pieces, check out the Rosewood Galaxy Staunton Wooden Chess Set Pieces King size 3″ Triple Weighted for about $50. 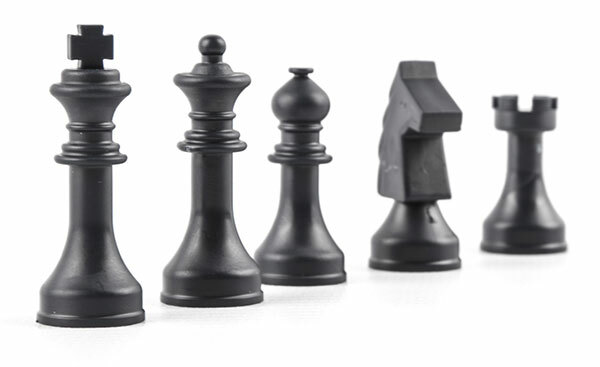 Chess pieces can be made from a wide variety of materials, the most common being plastic and wood. Plastic pieces are the most common for beginners and clubs where an inexpensive and durable option is desired. Wooden pieces are typically for nicer sets which are a little more expensive. Pieces can also be made from metal, stone, glass or virtually anything you can think of. These materials can be dyed, stained, painted or left their natural colors. Wooden pieces are often left their natural colors and have a clear coating so that the oils from your hands do not stain the wood. This can provide years of use. The most common way to size a chess piece is so that the base diameter of the piece fills approximately 75% of the area inside the square on the board. The height of the pieces is dictated by the height of the king which according to United States Chess Federation (USCF) rules should be between 3.375 to 4.5 inches and is more typically between 3.75 and 4 inches. The diameter of the king should be between 40-50% of it’s height. So how does all this work to find the right size pieces for the board you have? Let’s say the board you have has squares that are 2 1/4″, that is 2.25″ in decimal. If you take 2.25 and multiply it by .75 (for 75%) you get 1.6875 which is closest to 1.75″ or 1 3/4″ chess piece diameter. Now take that and double it to get a rough estimation of the height and you get 3.5″ in height (that would be the king’s diameter being 50% of its height). You could also look at it this way: a 4″ high king would have a base diameter of between 1.6″ (40%) and 2″ (50%). Assuming you are not using the set in a tournament and therefor do not have to meet USCF rules, you can really use just about any size piece that will fit on the board. Chess clubs will however tend to insist on sticking with the USCF rules. While looking for chess pieces online or in a store you will undoubtedly run into descriptions stating that a piece is weighted, 2x weighted, triple weighted, etc. Let’s talk about that for a minute. Adding weights to the bottom of the chess pieces makes them more stable and feel better in the hand. The more weight, the more stable. Unfortunately there is no standard to chess piece weights. Double weighted really means nothing. Once upon a time they used to put a single metal slug into the base of the piece for single weighted, two slugs for double and three for triple weighted. Even then, the slugs were not of a uniform weight between manufacturers, or often even from the same manufacturer. You can of course infer that a double weighted set will weigh about twice as much as a single weighted set from the same manufacturer today. Most sellers will display the total weight of the set which you can use to compare between sets. That I know of, there are no USCF rules regarding weights of the pieces (please leave a comment and correct me if you know different!) so I would recommend getting a set that feels good in your hand when you move them. The most popular sets I have seen include the Staunton Tournament Pieces, Triple Weighted with 3.75″ King and 2 extra Queens for around $16 and the Rosewood Galaxy Staunton Wooden Chess Set Pieces King size 3″ Triple Weighted for about $50. For those of you looking for something truly special, try the Rosewood/Boxwood Pieces Rio Staunton 4.0″ (102 mm) – 2 Extra Queens – Triple Weighted from House of Chess for around $125 shown above.